When superimposed, what do we get? 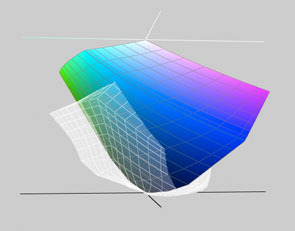 It is clear that some colors only fit into the printer color space but not into the monitor color space, and the other way round. How can we bring colors from one space into another when they don't even fit in? We could shrink one space to fit into the other, but this will change all the colors. We could transform one space to match the shape of the other, but that also would affect all colors. We could also cut a color space to fit the other. Each solution has its own drawbacks and advantages. But whatever solution is chosen, it is apparent that conversion from one space into the other nearly always degrades the colors, even if just slightly. It's a much more fundamental problem than merely lack of accuracy. The ICC has laid out several tactics to tackle this problem. Each tactic is called a 'rendering intent'. They are supported by the CMM, which (in theory) will let you choose your own rendering intent. In many cases a color profile will contain a default rendering intent which has been put there by the software producing the profile. This rendering intent basically comes down to shrinking one space to fit the other. Our eyes are much more sensitive to relationships between the colors than to single colors. Perceptual intent tries to maintain the overall appearance of the colors by preserving their relative positions. This can be a good choice for some photos. Saturation is a good choice when trying to keep brilliant colors intact. This may be the case in pie charts and business graphics. When one brilliant color isn't available, it will be replaced by another brilliant color. However, if the goal is accurate color reproduction, this is not a good option. This intent tries to keep all colors intact in relation to white. We humans tend to relate all colors to white, which means that this intent adheres to our color perception. Colors that fall outside the destination color space will be mapped to the closest available color. This option is the best choice for most photos as it preserves most of the original colors. This option simply maps each color of one color space to the exact same location in the next color space. This may sound like a good solution, but it isn't in most cases because many colors will fall outside the destination color space and will be mapped the nearest color. In the process a picture may get severely scarred. This rendering intent is best suited for 'color proofing' in the print industry.